We love balsamic vinegar in a cocktail and We Olive Fig Balsamic Vinegar is the perfect addition to this belly-warming cocktail made with bourbon. 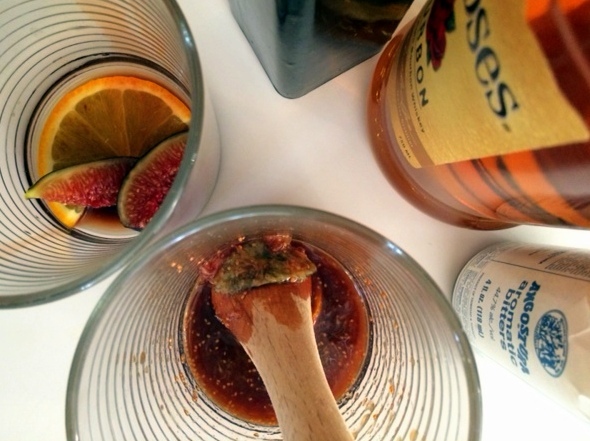 We’ve created a delicious twist on the classic Old Fashioned made with fresh figs and Fig Balsamic Vinegar. Cheers! In a rocks glass, muddle half the fig, one orange slice, bitters, vinegar and maple syrup until combined. Add bourbon, a splash of water and ice and stir to mix. Garnish with remaining fig and orange slice and enjoy.